CANTON, Mass. (October 4, 2010) – Do you dream about creating a delicious and unique ice cream flavor others will love? How about seeing your creation as the Flavor of the month in the world’s largest chain of ice cream specialty shops? 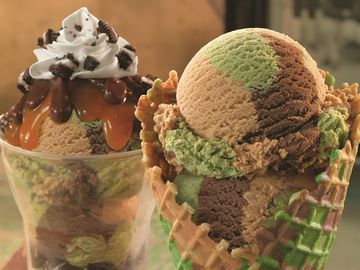 Today Baskin-Robbins launched a national online contest offering ice cream enthusiasts the opportunity to go wild and create a new ice cream flavor that will be featured in all US Baskin-Robbins shops in June 2011. From October 1through October 31, Baskin-Robbins invites ice cream lovers to don their virtual chefs’ hats and create a special flavor that they would like to see at Baskin-Robbins. Would-be flavor gurus can visit http://baskinrobbins.com/flavorcontest/Flavorcreator.aspx and virtually mix their own ingredients to create a new flavor. Visitors to the site can choose from 31 base flavors, a variety of ribbons such as fudge or peanut butter and loads of different mix-ins ranging from candies to cookies. The flavor creation contest comes on the heels of Baskin-Robbins retiring five flavors in honor of the brand’s 65th birthday in July. Now, as a result of the contest, a new consumer-generated flavor will be sold alongside some of the most famous Baskin-Robbins flavors like Jamoca Almond Fudge, Pralines ‘n Cream and Gold Medal Ribbon. The winning flavor will be developed in 2011 and will be sold in all Baskin-Robbins locations as the June 2011 Flavor of the Month. The contest is open to US residents of all ages. After the contest closes on October 31st, ten finalists will be chosen by Baskin-Robbins and displayed on www.BaskinRobbins.com. Participants will then be able to vote online for their favorite flavor from November 29th through December 12th. All ten of the finalists will receive free ice cream for a year. The winner will receive a trip for two to Boston which includes a three-night stay at a landmark Boston hotel, a night at the theatre, $1,000 in spending money and a trip to Baskin-Robbins headquarters where he or she will meet the Baskin-Robbins culinary team and spend a day bringing their flavor to life. For more information and official rules, please visit www.BaskinRobbins.com/flavorcreatorrules.